Speed up your computer use and become more efficient by using our typing tutor software to learn to type without looking at the keyboard. Unless you learn to type faster without looking at the keyboard then you are the most inefficient part of your computer system and are wasting part of your life. Touch typing is a skill that individuals and companies should be seriously looking at learning before they waste more time, effort and money each time a computer keyboard is used. Companies often spend a fortune on hardware and training courses, but fail to realise that their employees are wasting hours per day because they have not been trained to use their keyboards properly. Typing without looking at the keyboard not only allows a user to type faster and more accurately but it also frees their mind to think only about the words, instead of where the keys are. The solution to this problem is Touch Typist, a typing tutor which has been teaching people to type since 1985, longer than any other typing tutor on sale today. How does Touch Typist work? Touch Typist typing tutor first shows you the correct position for your hands and fingers before you start on the first of 201 lessons. The lessons, consisting initially of only two letters gradually introduce more keys and words using the keys covered so far, increasing in complexity until all the letters have been taught. Once the keyboard has been covered, the rest of the lessons are designed to present you with word and letter combinations which ensure that learning takes place. The idea behind Touch Typist was to produce a guaranteed way to learn good keyboard skills without being boring, gaving the user lots of feedback and at the same time, make the user want to progress through the course and learn this valuable skill. This was done by making the lessons short, by giving the user lots of feedback after each lesson and encouraging you to have ‘Just one more go’. The results of each lesson are used by Touch Typist to to set targets for the user, move them back a few lessons if they are struggling, and to produce the many graphs and charts in the software. After completing all 201 lessons, the job of improving speed, and more important, accuracy, starts. The software directs the user to work on lessons which have caused the most problems until those problems are sorted out. You will learn without getting bored due to the large amount of feedback presented by the software. In Touch Typist typing tutor, the user is given the ability to ‘own’ their progress through the many graphs which are used to inspire practice and development during the learning and skill building phases. The Download version costs £18 and can be instantly unlocked after purchasing. To have a CD copy of Touch Typist costs £20 which includes UK postage. Touch Typist is a well presented and useful utility which includes the professional polish of good quality software. Very user friendly, Gives a sense of achievement, Straightforward lessons, Flexible lesson plan, Covers all levels of ability. It's great value for money and, compared with Intellitype® and Mavis Beacon® (it's closest rivals), it's a lot more straightforward and rewarding to use." Touch Typist is a fine piece of software which achieves what it sets out to be. It's great value for money and, compared with Intellitype® and Mavis Beacon® (it's closest rivals), it's a lot more straightforward and rewarding to use. Touch Typist operates smoothly and at an impressive speed. Why would I want to learn to type properly? If you realised how much faster you could work if you had the skill to type like a professional, how much quicker you could learn to write emails, chat online, use software or generally use your computer you would be answering this question yourself. The longer you leave learning to type correctly, the more of your precious time and effort will be wasted. If you use a computer keyboard then it’s essential that you learn to type correctly, it’s not as difficult as you might think. If you use our typing tutorial software you will have the tool to become a proficient touch typist with a skill for life. Take a look at our site, if you have any questions please feel free to contact us by email or phone. 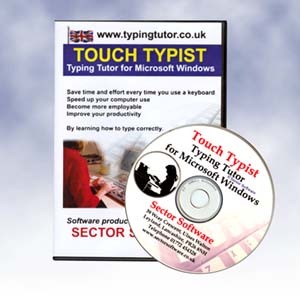 If you want to start learning straight away, simply use our secure server to order your copy of Touch Typist typing tutor, you can either have the CD version which should be with you within three or four working days or the download version which will be fully installed and working on your computer in minutes. Learning to touch type using a typing tutor will save you hours of wasted time looking at the keyboard, you may not at the moment even be aware of the thinking time you waste ensuring your fingers press the correct keys. Being able to touch type frees you to get on with whatever job you are doing while the typing seems to happen simply by you thinking about what you want to appear. The process of typing becomes something that happens in the background without any conscious thought for how the letters arrive on the screen. Touch typing is a skill which will speed up not only letter writing, but all your computer use, data entry will be faster, you will seem more professional to others who are impressed at how you never need to look at the keyboard while you type. Writing emails will take a fraction of the time it currently takes, as a result you will be able to spend more time doing what you want to do on the computer. Being able to touch type can be added to the list of skills on your CV and may help in job applications. The benefits of being a touch typist are too numerous to mention here. Many users of our typing tutor who we have spoken to, have stated that now they can type they can never look back, they now find it difficult watching someone who cannot touch type, when that person is using a keyboard.